Detroit MI March 31, 2019; On a perfect spring afternoon Andy Didorosi, owner of Detroit Bus Company put almost 170 kids on wheels in a massive giveaway he coordinated on Facebook. He found two Jeep enthusiast groups, Wicked Jeep and Monster Jeep, to bring tricked out 4 by 4s for kids to crawl around. It was a picnic on wheels at Detroit Achievement Academy. 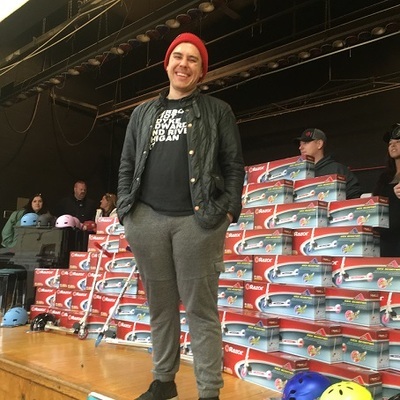 Students, teachers and parents gathered in the gymnasium March 28 to receive their free scooters and helmets. “We want this to be something the kids will remember forever. We’ll make 167 kids super stoked before their spring break,” said Didorosi. The cause is a mighty one in the hotly competitive world of electric scooters. Statistica estimates 50 million scooters will be on the road globally in 2020. They are the newest fad to hit the transportation industry, offering a little faster, easier way to get around urban areas. You only pay for your use time, at approximately 15 cents a minute. Scooters offer a mobility option for automakers as well. Ford Motor Company purchased Spin, another California company for $100 million in November 2018. Spin operates in nine cities and five college campuses. For those riding upon the scooters, the price point is considerably less than a car yet perfect for short commutes. Bird was the California-based company that first developed the idea of pay-as-you-go scooters placed in strategic locations in urban areas. This would not only generate revenue for rentals, but prompt an interest in purchase, especially those enjoying urban living. No parking fees, no garage storage, no weight. Just fun and fluid transportation for a world choked with cars. As the scooters whiz around Detroit, Didorosi was one of the first to see a problem in delivering the scooters back to the charging station when they were discarded around town. Some ended up in hard scrabble apartment buildings. Recovering scooters is worth up to $20 a vehicle. Even though the scooter is designed to freeze up when not in use, the wheels loosen and spin smoothly when the battery is dead. Didorosi saw kids inventing games, shrieking and blinking with delight, it killed him to grab the scooters back. He put out a post on Facebook for help, got a story in the Detroit Free Press, and kept putting out messages for help. His goal was 100 scooters and helmets. He almost reached 170. “We want to use the forces of good to set this injustice as right as we can. Scooters are awesome and Detroit’s kids should have access to the exact same experience as people with phones and funds,” he added. First Didorosi and friends staged a rally in the gym with kids playing relay races. The winners won Razors. Then the curtains opened on the stage and he announced all the children would receive Razors, their parents had already been invited to help them take their scooters home. Kids and parents stood in line for nearly an hour to receive their Razor scooter and helmet, but few kids were pushing and shoving. It felt more like Christmas as kids tore open the boxes and assembled their scooters in the gymnasium. Jeep owners with tricked up vehicles let parents sit on the hood with their kids taking pictures, or crawl around the interior. The air of generosity made friends out of everyone. “Our program is based on the concept of a random act of kindness. We want to hook kids up with no strings attached in a surprising way and give them a positive memory they can take with them along with the ride,” Didorosi said. For those interested in donated money or scooters email help@detroitbus.com or call (313) 444-2871.